Looks like Thor's burly Frost Giants received a total makeover for their upcoming appearance in Marvel's superhero blockbuster. Get a closer look at this mythic character reboot. 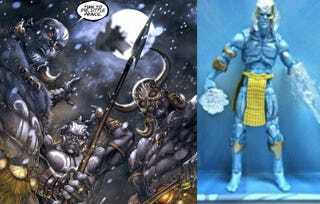 So that's a pretty skinny giant right there, but then again this may not be the only Frost Giant in the Thor mix. We know for sure that Colm Feore is playing the ice giant Ymir, who is over 1,000 feet tall, but we also know that Thor's family and its relationship with the Frost Giants is pretty pivotal in this film. So this could be an example of one of the many massive frosty warriors. What do you think? Too skinny, or just right? Also remember, this is just a toy — and how often do the toys really look like the finished product?